Celebrate Taco Tuesday with this delicious Mexican Hummus Dip. Add hummus and taco seasoning to pie dish or 8 x 8 baking dish. Mix hummus and taco seasoning until well blended. 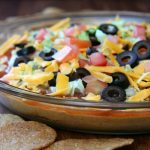 Sprinkle lettuce, tomatoes, cheese, and black olives over salsa.